Mickey Mouse birthday party theme ideas for kids. 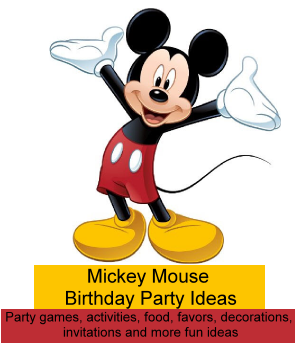 Fun Mickey Mouse party ideas including decorations, invitations, activities, games, party food, favors and goody / loot bags. See our Mickey Mouse Ears template to create these invitations. Print and cut out the Mickey Mouse ears template and the insert to use for a pattern. Trace and cut out the Mickey Mouse Ears from black cardstock or heavy construction paper. Trace and cut out the circle insert (You can transfer to a word processing program and type up the invitation information on the insert before cutting out) in white, red or yellow paper. Glue the insert to the large black circle of the black template. Glue a piece of red scrapbook paper to cover 1/2 of blank black note cards. In the center of the red paper glue on two small white buttons (or make buttons out of white paper) and place a yellow ribbon across the top of the red paper. Along the walkway to the party entrance have Mickey Mouse ears or mouse footprints made from black construction paper taped to the ground. Decorate the party table with a solid red tablecloth and black plates - use three plates at each setting 1 large black plate and 2 small plates for the ears. Yellow napkins with red flatware are a great accent to the black plates. Use black baseball caps (you can cut the brim off to look more like the hats at Disney World) or black headbands to make fun Mickey Mouse ears for the party guests. Cut out 3" circles out of stiff felt and glue onto the hat or headband. Print out Mickey Mouse coloring sheets and have them laid out on a table with lots of crayons. Let the children choose a sheet to color while the other guests are arriving. Object of the game is to find the hidden mouse ears - the special red ears can be turned in for a prize. Cut Mickey Mouse shaped ears out of poster board about 3 - 4" wide. Mickey Mouse Ears Template Cut most of the ears out of black poster board or cardstock, but also cut 3 or 4 (more depending on how many special prizes you want to give out) from red poster board or cardstock. Buy several small prizes and number them. On the back of the red mouse ears place a number that corresponds with one of the prizes you bought. Hide the mouse ears all over the backyard, park or party room. Send the children off to look for the hidden mouse ears. If they find a red one they get the prize that corrHide black Mickey Mouse ears and have a number on most of them soeveryone can turn it in for a prize. If you are having a piñata you can enclose the red ears inside the piñata with the party candy. You will need three large black containers ... 2 that are a little smaller then the other container. Trash cans or plastic tubs will work. Set out the black containers to look like Mickey Mouse's ears - the larger one in the center with the two smaller containers at the top of the larger one to look like the ears. About 4 -5 feet from the Mickey Mouse ears place a piece of tape on the ground that will be where the kids line up for the game. Give the first player in line three small balls (ping pong balls are fun to play with because they bounce and can bounce in and out of the containers) and have them try and get one ball in each container. When the kids have all played the game move the piece of tape back a few feet to make it more challenging. Buy a large poster or draw a picture of Mickey Mouse on a large poster board. Trace Mickey's tail from the poster and make several tails out of poster board or construction paper ... or use long pieces of black ribbon for the tail. Make one for each party guest. Write their names on the back of their tail and attach a piece of double stick tape. Hang the poster on a wall and line the children up opposite it. Blindfold them one at a time and see who can place their tail closest to the tail on the poster. The closest to the original tail wins. Cut out Mickey Mouse ears from cheese, cookies, brownies, fruit or almost any food item and place them on plates on the party table. For fun fruit and cheese kabobs cut out mouse ear shapes from cheese and fruit. Skewer onto wooden skewers and place standing up in sturdy cups. Pizza - using Mouse Ears cookie cutter cut out ears from slices of mozzarella cheese and place on the pizza. Bake cupcakes in red paper holders, ice with white frosting and insert two Oreo cookies in the frosting for mouse ears. Red paper sacks - fold over top about 3 inches to close bag and paper punch two holes through the part that is folded about 3 inches apart. Thread yellow or black ribbon or a black pipecleaner through the holes (from back to the front) and tie the ends in front. Glue on two white buttons in the middle of the red sack for Mickey's buttons.